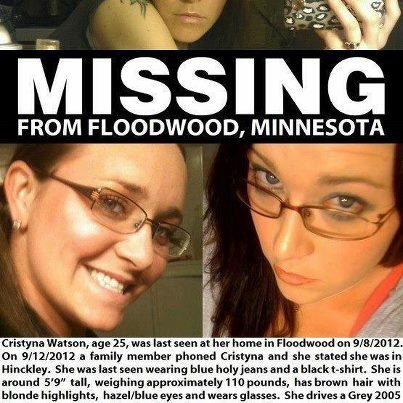 25 year old Cristyna Leah Watson has been missing since September 23, 2012 from Floodwood, MN. Sadly, her body was found along Reservation Road in Cloquet on the Fond du Lac Indian Reservation. The medical examiners have positively identified the body as that of missing Cristyna Leah Watson. The ME is stating that Cristyna Leah Watson died as a result of homicidal violence. The Ramsey County Medical Examiner today identified a woman whose body was discovered last evening on a property on Reservation Road in Cloquet on the Fond du Lac Indian Reservation. Cristyna Leah Watson (DOB 1-19-1987) of 209 E. 9th Avenue in Floodwood, MN, died as a result of homicidal violence. Watson was last seen by family members on September 8th and had been the subject of a Missing Person Bulletin issued by the Floodwood Police Department. A suspect in Watson’s death is in custody and is expected to be charged. 22 year old Michael William Siewert, is being held on an unrelated August shooting charge is the suspect in the above homicide and is considered by police to be a member of the Native Mob criminal gang. Siewert is expected to be charged in this homicide. A Duluth man being held in Carlton County on an unrelated charge is expected to be charged in connection with the death of Cristyna Leah Watson of Floodwood, Cloquet police Chief Wade Lamirande said this afternoon. Michael William Siewert, who police said they believe is a member of the Native Mob criminal gang, is being held in the Carlton County Jail in connection with the August shooting of another man, also believed to be a member of the Native Mob, according to the criminal complaint against him in that case. Stephen James Smith was shot in the foot on Aug. 24, the complaint said. Siewert, 22, has been charged in that case with second-degree assault in a crime committed for the benefit of a gang and two counts of possession of a firearm by a felon. 25 year old Cristyna Leah Watson has been missing since September 23, 2012 from Floodwood, MN. She was last seen by her mother on September 8 and last spoke to a family member on September 23 when she said she was in Hinckley. Watson is believed to be driving a gray 2005 Pontiac Grand Prix, with Minnesota license plate 408HYJ. A statewide missing person alert was issued as Cloquet Police Department, Carlton County Sheriff’s Office and Fond Du Lac Police Department are working with the Floodwood Police Department on the missing persons case. Watson, 25, is described as a white woman who is 5 feet, 9 inches tall and weighs 110 pounds. She has brown hair with blond highlights. Her eyes are hazel and she wears glasses. She was last seen wearing blue jeans with holes in them and a black shirt. Anyone with information on the case should call 911 or contact the Floodwood Police Department at (218) 476-2239 or the Carlton County Sheriff’s Office at (218) 384-4185.